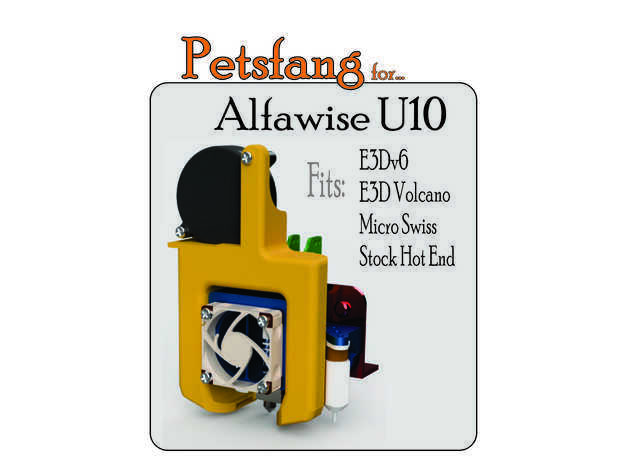 Petsfang Duct for CR10 MicroSwiss/Stock/E3Dv6/Volcano/TevoTornado /Tarantula Hot End/E3Dv6 CNC Mount & 5015 fan Bullseye by dpetsel is licensed under the Creative Commons - Attribution - Non-Commercial - No Derivatives license. Print with 4+ walls with 50%+ infill. 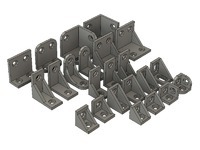 These are structural parts and need to be strong, especially the mounting points. 9.27.2018 I adjusted the duct to have a little thicker arms around the holes and changed the larger inlet so you won't need a calibrated printer. 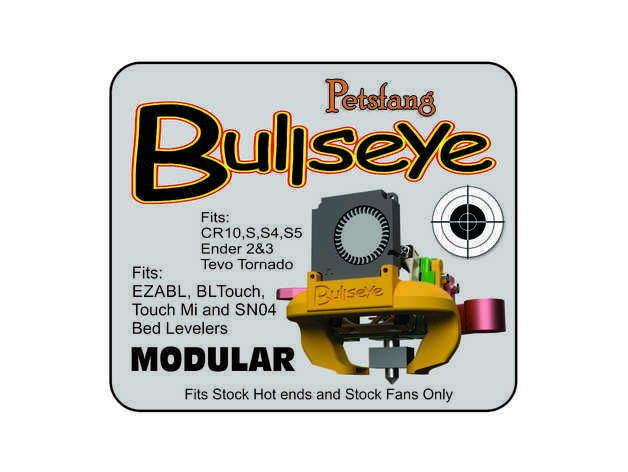 I’ve had some questions about the duct height and the Petsfang v2 and Bullseye. I decided to borrow a colleagues' smoke generator to give a better visual of the airflow since the "water tests" only show the turbulence. This really shows the narrow directional airflow with low pressure air exhausting the “used” hot air to the back of the build plate. This provides a constant fresh airflow on the filament. It also shows why I suggest you mount your duct outflow ports just below the insulation. 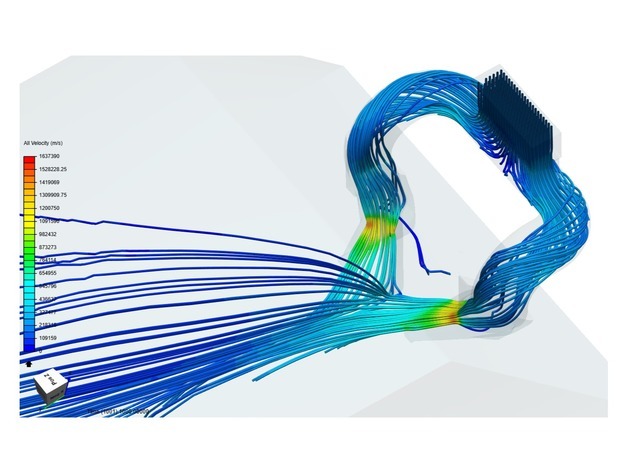 Air exiting the forward area of the outflow duct is high velocity to the back of the port it is low velocity/pressure. The plenum keeps the airflow balanced between the ducts as you can see from the exhaust. Here is the CFD V Trace for the Bullseye. You can see in the smoke generated video that it matches the the airflow simulation as anticipated. What files do I need to print? There are PDF docs in the files section to reference the files to print for your machine. Print with 6 walls or 80 - 100% infill. These are structural parts and need to be strong, especially the mounting points. Flow - Raised to 105% with Octoprint when I saw fill was printing poorly. Could add it with slicer. You'll need to replace the short 3mm stock front screw with a 3mm x 25mm socket head screw. 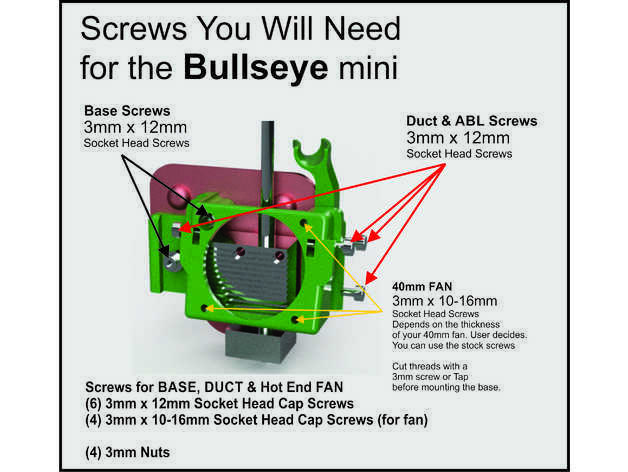 Re-use one of your short 3mm screws from stock fan base if you are using the Stock Fan Duct. 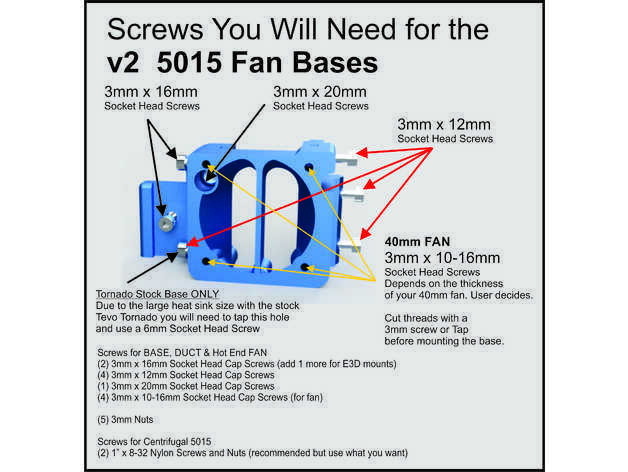 5015 fan screws are 6x32 Nylon with nuts 1 inch long. v2 bases use a 3 x 25mm Socket Head Cap Screw to the back plate. (Seems it's readily available at the hardware store) To mount the duct to the base I used 3mm x 8mm socket head screws. To mount the wire strain use one of the screws you took off with the stock parts cooling fan or a #2x3/8 or a 2mmx8mm screw. Since none of this mount touches the hot or cooling end of the Micro Swiss or stock hot end you could print this with PLA. I wanted to try PETG so my final duct is printed with white PETG. I was asked by Tim at TH3D to design a duct system to cool his new .8mm nozzle on his Alfawise U10 for managing good cooling on his large vases. This mod incorporates 2 separate, enlarged plenums with a balance port in between. The balanced port adjusts the positive pressure within each duct to produce a balanced airflow from each out-port. It really has a ton of velocity at 100% so I would suggest you run some test prints with your filament to check what your needs for any printed parts will be. 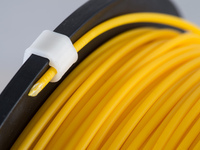 It is designed for .3mm or greater layer thickness and .6-1mm nozzles. Files have the Dualfan in the name and will fit the corresponding bases. Dualfan should be used with a Volcano Hotend for best performance. For those of you using any of my modular bases I have added a dial gauge mount the fits the left hard point on the base. It is adjustable by 10mm so it should fit a lot of dial gauges. It tucks the dial gauge right close to the X rail and really works well. Adjusted the right modular BLT mount to better adjust to all v2 mods. Got a message that the new Creality Ender 3 has a little taller profile. Added 1mm height adjustment to ducts. Added Touch Mi Modular ABL mount. Designed with the assistance of member Debiax. More info to come. Here are the screws you need. Moved the TRONXY Files to their own page. Working with Brian Rowe on some Petsfang files for the TronXY x1,3,5. Files are at the bottom of the files page. I will be moving them to their own page once all testing is done. For those of you wanting and SN04 probe mount for the v2, I adapted one of my other designs to fit the probe. You can see it here. I got a message from a couple of users that their CR10 v2 BLT was too far from the base. I reviewed my files and they were right. The BLT mount on the stock CR10 is 2mm lower. I have adjusted those files and they are uploaded. Sorry about that. New printer on the market, the Alfawise U10. I've designed a whole set of mounts for this as well. All "v2" files are up! 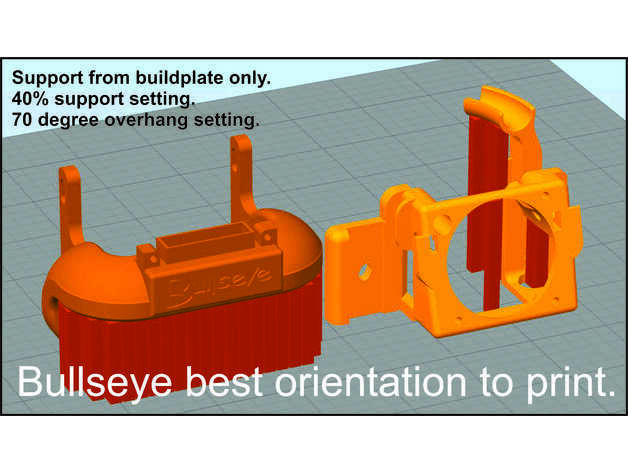 There are several tiny measurement differences between the Tevo back plate and CR10. I took these differences and combined them into 1 base mount that will work for both. I added a breakaway airflow deflectors in the bottom of the combined base to accommodate the Tornado Hotend. Modified screw holes for positioning around ABL devices and enlarged them so you can use 3mm screws. Added EZABL optional sleeve inserts for the new 12mm ABL devices. Moved EZABL location so it will have 1 offset for all hot ends. Changed length of the wire strain option and reinforced the neck. New duct exterior profile. Radius inside and out. Cut out around nozzle for more view. Plenum volume stays the same. Outlet size and angle stays the same. I believe the offsets are now a plugin with Tim Hoogeland's, TH3D Unified Firmware. Really happy with these upgrades. Relocated screw holes and changed them to 3MM screws to secure duct to base. Changed cap to base and base to back plate screws to 3mm x 25mm. Inserted screw recess in the Main Base for 25mm screw to back plate on main base leaving it hidden behind main caps. Added side interior clearance for 3mm screws extending through the base on the 40mm fan cap. Added lower construction feature to strengthen front to back lower right and allow more room for wire routing. First group of files are the Volcano updates. New duct exterior profile. Radius inside and out. Cut out around nozzle end of the duct for more view. Plenum volume stays the same. Outlet size and angle stays the same. Relocated screw holes in the base and changed them to 3MM screws to secure duct to base. Higher mounting point so you don’t have to change Z endstop or lower your buildplate. Reduced the clearance for the back nuts to keep them secure. Parts going forward will have the option to use 3mm screws. 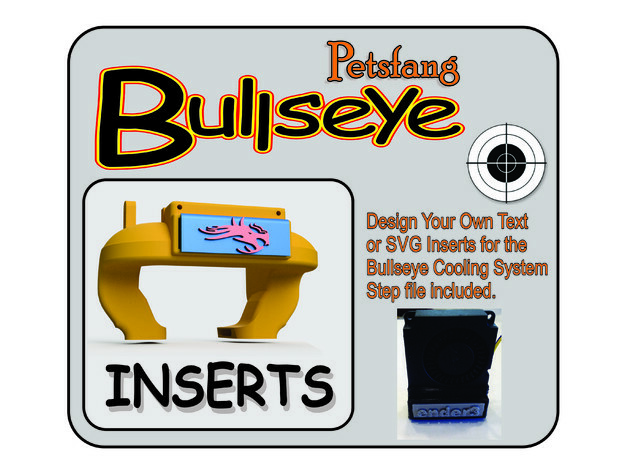 A member on Thingiverse did a mod of my Petsfang Duct to cut the 90 degree edges on the front of the Petsfang. I realized his mod had changed the volume and could otherwise affect the airflow. Static pressure ducting can flow around 90 degree angles in the plenum because there is no significant airflow speed in the plenum just static air pressure being regulated by the outlets. So…. For those of you that wanted the Petsfang Duct without the harsh 90 degree corners and harsh interior corners, I redrew the duct to accomplish this. Because it lost a lot of volume doing this you will notice the duct is about 5mm taller and 3mm wider front to back to gain back this volume. You make your own choice. Some say it looks better. Some like the shorter. more compact original. This mod of the Duct will install & perform exactly like the original. I will leave both STL files up. It prints in the same orientation as the original. "Front-Face Down"
The Petsfang is my design but I couldn't have prototyped all the mods without the help from, Cappy De, Tarek Delbridge, Silvio Garieri, Pemic, Richard Thomas, David Cruz, Davey Wavey, Joel Adams, Josh Ferri among others who spent hundreds of combined hours beta testing my designs to ensure it's superior results and fitment on multiple platforms. I can't thank them enough. 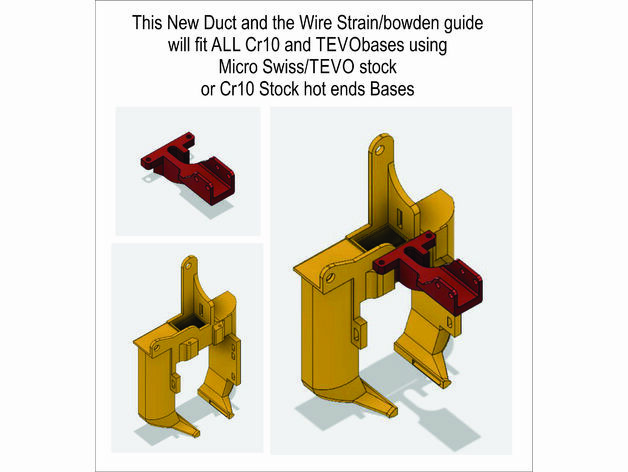 Updated Tevo Wire strain. It appears that if you put the zip tie with the clip portion of the zip tie to the side of the wire strain it interferes with the left side rail. I wasn't anticipating this. If you put the clip to the top or bottom it has clearance. The new strain takes this into consideration and will clear even with the clip to the side. I have given these to a lot of people. This is a top and bottom sleeve that fits through the standard 18mm ABL mount and allows you to use a 12.5mm ABL. Since this is an adapter it has the same offsets as the original 18mm. It will fit my mount or almost any 18mm mount. They are interlocking top and bottom. No need to print a new base just to try a 12.5 ABL. For putting together such a great installation tutorial. All Tips are greatly appreciated. When I upgrade or re-design parts they will always be backward compatible. If I change anything on one part I will verify that it will fit on the prior parts. A base you downloaded 2 months ago will fit a duct I redesigned today. Found another independent water test today. Really shows off the centralized airflow without any turbulence and focused less than a mm below the nozzle. Added the "Naming Convention" for the files displayed in the files section. It is at the bottom of the page under printing notes. It is an LED Light Bar for the Petsfang. I am fine tuning parts. I have increased the center fan wall thickness on Tevo bases to make them a little cleaner to print. I removed a small cutout in bottom of base that is not needed for access to a grub screw on the Tornado like it is on the CR10. Added CNC Duct for E3D Volcano Hot End. 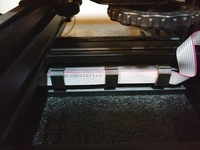 You will need the spacer to locate the BLTouch the correct distance from the bed plate. Modified modular wire strains for close tolerances to right and left rails and brought down 8mm to clear the wheel/bearings holding the back plate by 3mm. It was brought to my attention by member Silvio Garieri that the wire strain didn't allow for the full 400mm height to be used on his TEVO. I made a modular duct that can be used with our without the part. The wire strain with the wires attached will clear all aluminum guide rails. Of course if you didn't use the wire strain mod you had no issues with clearances anyway. Designed a cap for the E3Dv6 & Volcano mod to allow the use of the stock or upgraded 40mm fan to cool the hot end heat sink. While I was at it I modified the interior of the duct to supports with some minimal fillets to allow it to print cleaner and easier, for those of you that had problem. Use the Bases with E3Dv6 & Volcano prefix. Member Joel Adams found his TEVO Tornado printed base fit tight on the base plate. I had Cappy De verify base plate thickness. It appears TEVO back plate is 3 tenths of a mm thicker than the CR10. I adjust TEVO files to reflect that thickness and make the base slide on easier. Updated TEVO base files marked V2.21 are current. A couple of you said the Micro Swiss stock fan duct was a little tight to fit to the top of the TEVO Tornado base. I added 4mm for clearance and adjustment down to the nozzle in a seperate STL file. Independent testing from user Pemic showing airflow with water test. Pics. Worked with Thingiverse member Pemic on TEVO Tornado base mount. Large cutout in lower base to allow easier routing of hot end wires. Since this is a the Tornado is a CR10 clone it appears there is a little difference in the clearance to the X Gantry. Back clip for mounting adjusted .3mm to clear the gantry better. Because of the X gantry clearances I moved the EZABL and BL Touch to give better clearance and stay within back mounting base. E3Dv6 Petsfan Duct mount for the popular CNC machined aluminum base. Worked with Facebook member Cappy De to design a duct for the popular CNC mount for the E3Dv6 being sold on Ebay and other sites. Cappy De was good enough to test print these mounts for me for fitment. They hold extremely firm to the CNC support and will be a good addition to that mount. You will notice that there are a lot of filets and weird angles to allow for a clean print with supports from build plate only. Don’t forget to set supports for these and check your slicer settings. 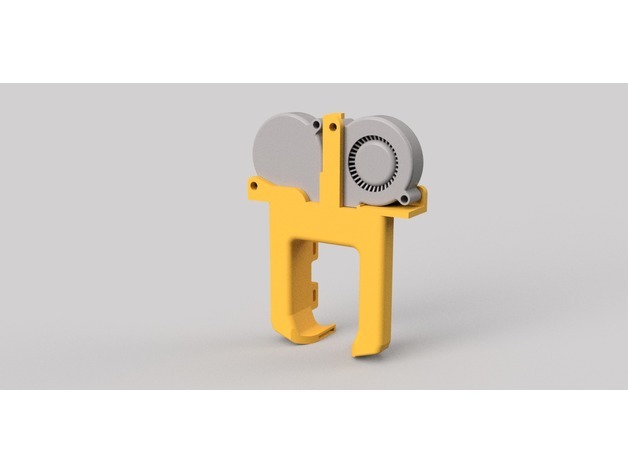 I want to thank you all for your support of this design and if you have a suggestion or questions please use MESSAGE on Thingiverse to contact me. I read every Message and don’t discount any suggestions. I’ll get back to you as soon as I can. 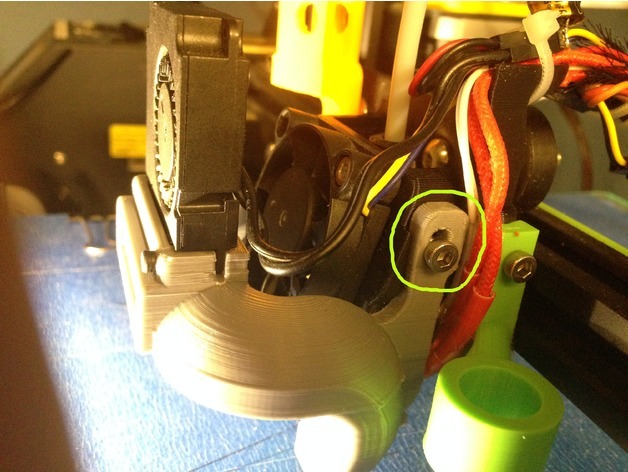 A CR10s user had a problem with his stock hot end wires being able to be bent to the base side race relief. I put a small "back wall" extending from the race to keep your wires tidy and away from the X Carriage. I put a bigger lower relief at the heat block and widened the race. I did this to all MS-Stock and E3Dv6 bases. I test printed a base and it gives a lot more clearance for your hot end wires while maintaining the strength. 4PM Central- TEVO base files uploaded. Took the Tevo base files down temporarily. I forgot the fan holes. I am so sorry. TEVO Tornado mounts are up. I have not seen a "Make" yet. Let me know how it fits. E3Dv6 base with BL-Touch is uploaded. TEVO Tornado mount is done. Waiting on results from Beta testers before I post the STL files. BL-Touch Base for Micro Swiss and Stock hot end uploaded. Fitting is done for E3Dv6. STL files are up. Will post the screws you'll need in notes. All are 3mm. Let me know how you like it. I also renamed all the files with prefixes to show what fits with what. MS-Stock prefix parts are for MicroSwiss or Stock Hotend. E3Dv6 prefix parts are for E3dv6 Hotend. Each similar prefix parts are interchangeable. When mounting your E3Dv6 hot end make sure you mount the longer portion of the heat block forward. This keeps the heatsink cooling air from flowing over heat block and reducing the temp. Test printing of E3Dv6 base coming out better than expected. I purchased a V6 clone from TH3D and a CR10 metal base plate from Tiny Machines to use as my reference for installation tests. Some pics in upper pic area or in comments. Will release STL files when tests are done. Test printing the E3Dv6 Petsfang for fitment/ mounting and clearance. I'll keep you posted. I am working on base mounts for E3dv6 & Tevo Tornado. My main objective in my design besides the exceptional directional air flow, is to make everything very easy to print and mount (even for the novice). I design fillets, angles and radii to allow for printing with no or very minimal supports. Please bear with me on the E3dv6 and Tornado mounts as I have ordered the E3Dv6 and a CR10 X carriage replacement back to make sure my design works flawlessly with them. Working on an E3d v6 mount and a Tevo Tornado. Slaterbbx has installed this fan and is loving it. He made some great suggestions for changes which I incorporated in the new STL files with a prefix of 1-29. I have made no alterations that would affect the way these parts would fit with the original STL files. I have just given improved options. If you print any of these they will fit with the original files. If you are using any other slicer adjust accordingly. Added Petsfang Duct for stock radial fan. It will not be the velocity of the 5015 but will let you take advantage of the superior directional airflow this duct offers with the stock radial fan. I had someone ask for it, so here it is. Added base STL without the EZABL mount. I have heard some of you don't like the 5015 because you can't control the fan speed. The windings in many of the 5015's don't like the PWM signal that is used to control the fan speed. PWM sends On and Off pulses to your fan. The length of these pulses cause the fan speed to change. To get around this you can wire in a 16v 220mf capacitor (I use these a lot of these in RC airplanes as voltage glitch busters and get them from Digikey) Solder the capacitor in parallel with the power. Capacitors have polarity so you will damage the cap and or your board if you wire it backwards. Caps have a polarity strip showing leg polarity on the side of the cap body. Wire negative to negative wire of your fan and positive to positive. I can get my cap to bleed down enough voltage that there is barely any air coming from my duct. It shows 1% on my CR10 display. Do not solder a cap in your system if you are not familiar with electronics. Be aware that caps have long legs and will have to be insulated clear up to the capacitor base to keep them from shorting out to the CR10 base or it's other leg. You do this at your own risk. It is 12v DC current. Did some bridging tests with this new duct. Test spanned 5mm x 200mm longest with no support on both X and Y axis. The duct cooled the filament allowing 200mm bridging with not one extrusion loss. Installed my EZABL today with this duct. Took dimensions from my original Fusion design and used X-offset +48: Y-offset -2. It worked PERFECT! Love this duct blower and the EZABL. My last design worked well for what I was printing but an engineer friend saw it and gave me reasons to maximize the design. My buddy designs large commercial HVAC systems gave me a crash course on radial fans, static pressure, ductwork and outlets and why my original fang ducts weren’t utilizing the flow to cool the filament. Based on his info I created a design to maximize the airflow to the tip of the Micro Swiss hot end. Based on the 4.2 CFM of the 5015 fan I designed a large main duct for static pressure which reduces to 2 small rectangular outlets to convert the static pressure to directional velocity. There is a small baffle inside one duct to reduce the flow to that side which puts the turbulence just off the center of the nozzle tip. The duct can be adjusted up and down 1.5 mm to direct flow to the tip. It actually works incredibly well. The Youtube video is not real focused but you can see the airflow is right on the tip and drops off 2mm below and 2mm above the nozzle outlet. I’m going to try this with PETG to see if the bridging stays firm. I’m pretty happy with it. It should work with the stock hot end as well. You can see in the video it pulls the paper just to the side of the tip and doesn't pick up the flow till 2mm from the tip. Printed my first PETG ever. Printed with this fang and layers and bridging worked great. Pic above in group. It is the white Hatchbox PETG. 245 degrees hot end and 70 bed temp. Extended piece on the top of fang is for cable management. 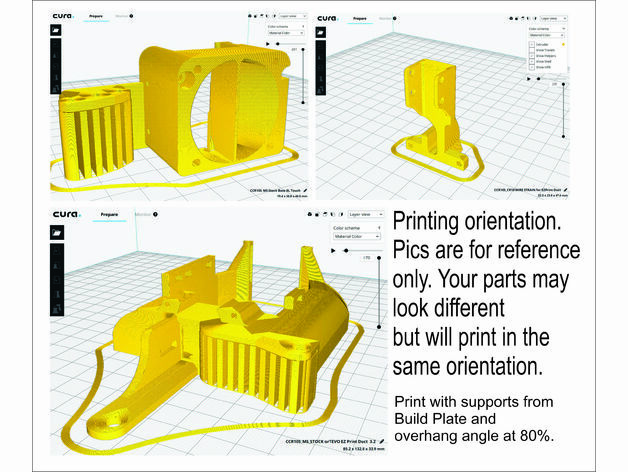 Here are some of more parts to enhance your printers capabilities. Not sure why Creality mounted the wires with tape on the Bowden tube. I've been printing with a makeshift bracket on my CR10 since I got it and since I'm printing PETG now decided to make a permanent bracket. 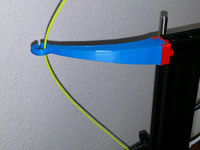 This allows you to take it off the Bowden tube and let it ride freely between the wire guide mount and the hot end. I have put a lot of hours of printing with this and it never sags or comes close to intersecting Bowden tube travel. The Bowden tube rides freely from my Petsfang mount to the wire guide. 3mm with T-nuts mount. It mounts to the back side of the Z axis rail. My favorite design. When you start to print flexible filaments you will find this a dream. It also improves PETG and PLA printing. 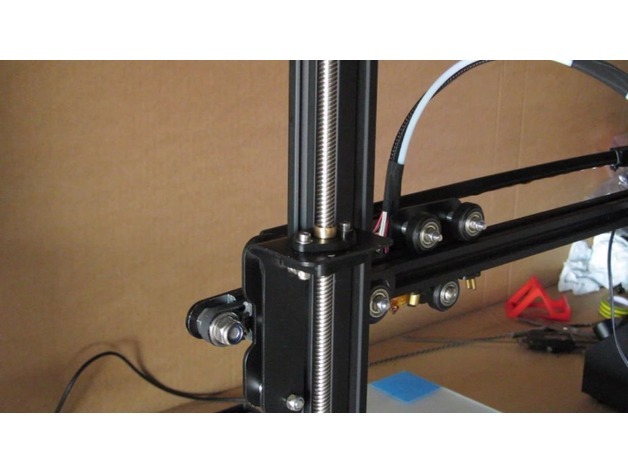 It is a very simple to install Titan Direct extruder assembly. I use it on all my printers except for the one I test prototypes on. A beautiful well thought out design for dual mechanical Z. Say thanks by giving dpetsel a tip and help them continue to share amazing Things with the Thingiverse community. Say thanks and help dpetsel continue to share amazing Things with the Thingiverse community. You'll need a PayPal account to tip dpetsel. Click the button below and you will be redirected to PayPal. Once the payment is complete, you'll be brought back to Thingiverse.